Dimensions 420'2" by 53'7" by 19'8"
The Black Hawk was completed in 1913 as the Santa Catalina and purchased by the Navy in 1917. She originally served as a minesweeper tender but was converted to a destroyer tender, with a torpedo workshop, in 1920. She had been serving in the Far East for twenty years when the Pacific War broke out. 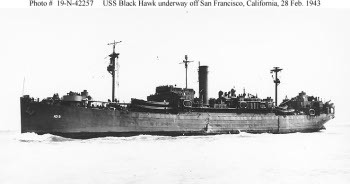 The outbreak of war found Black Hawk at Balikpapan, where Admiral Hart had positioned her to support the move of his destroyers to Singapore in support of the British. She survived the war.